Creating this rustic wood wall art was a simple project when it came to building the panels and thinking up designs, but when it came to pulling the trigger and actually arting them up I spent a few days doing the deer-in-the-headlight routine. Side note: I’m not sure what compelled me to type the phrase “arting them up” but I’m going to use it for everything now. “Why do you have paint on your face?” “I’m arting it up.” I think I may have had a linguistical stroke of genius here. Continuing on the theme of my genius– particularly as it relates to managing my project ADD– I was smart enough to leave the wood panels on the floor directly between the kitchen and the computer, and since I only pick up unfinished projects under penalty of death, I couldn’t exactly ignore them while they were in art-limbo if I was stubbing my toe on them every day. See how that works? Which I was actually really enjoying, but I decided the bridge was going to be too detailed for the character of the rustic wood. I may do a larger pencil sketch of the bridge and frame it someday, but for the wood panels I reverted back to the idea of using some sort of text. 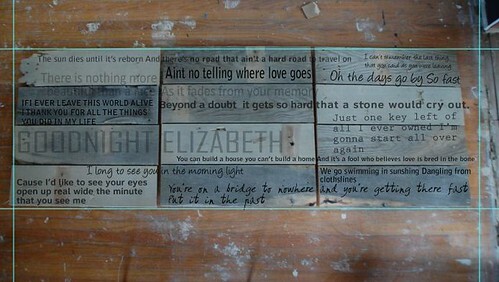 I tried a couple of variations of using some of my favorite music lyrics. And the little *idea* lightbulb flashed on over my head. This could be the perfect silhouette for my wood panels. 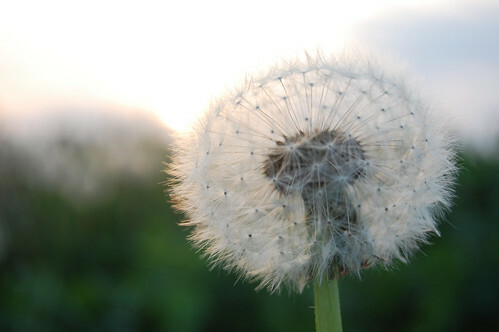 I used a couple of comps from iStock to help me get the size and shape of the dandelion and seeds right. 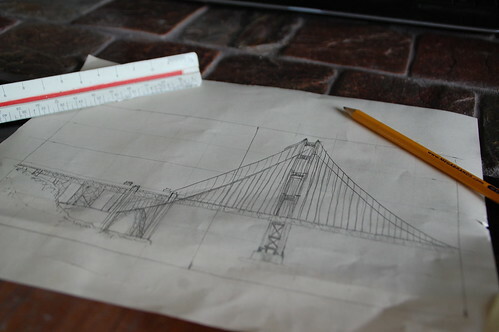 There was a lot of measuring and pre-drawing before I even started with the wood. Then I did light pencil sketches on the panels and traced over them with a Woodcrafters Marker (which is basically wood stain in marker form.) I actually did a few tests on the back of one of the panels so I knew how much pressure to use with the marker. I also considered using watered down acrylic paint, but in the end the marker had the look I wanted so I didn’t see any reason to make my life more difficult with things like cleaning up paint and brushes. 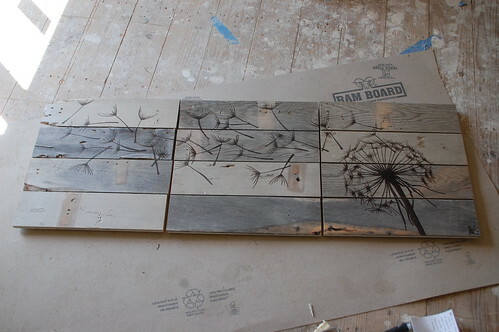 I had just a few “bleeding” issues in between boards, but for the most part it was pretty easy to get the dandelion onto the wood. It took about an hour. Of course it isn’t perfect, but I’m not a master artisan either. I’m just a girl with some old wood and a glorified sharpie. And there she is… all arted up and ready for hanging. Incidentally, I have no idea where I’m going to put it at the moment so “Part 4″ will be hanging the final pieces. I was thinking possibly over the bed, but I’m not sure I love it on the gray wall. No matter where it ends up, I’m happy just to be able to cross it off the unfinished list. In the end it was incredibly easy to create (once I knew what I wanted to to look like) and only cost $3 for the Woodcrafters marker. What do you think, is this a project you would do? Would you have gone a different direction with the art? LOVE IT! 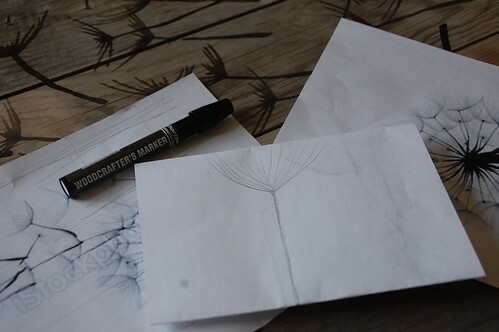 Wow, the dandelion turned out so realistic-looking – you’re pretty talented, missy! Terrific! 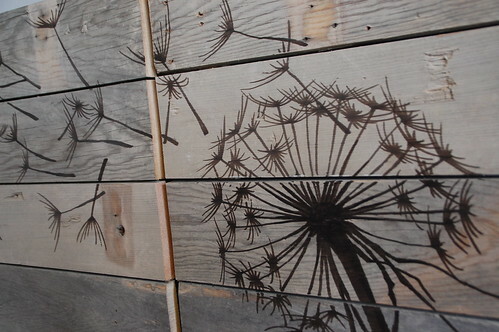 I love the blend of the natural look of the dandelion with the wood. Great choice! I LOVE this artwork. This is exactly something I’d love to have hanging in my home. It’s brilliant. The art is perfect for this – I can picture the art in a great outdoor room like a patio..
Whoa. It turned out really beautifully! Nicely done. I like it. It does sound pretty crisp even though we were like statues for the first 30 minutes or so. It sounded a lot better than it felt as we did it. I am looking forward to the next ones because other than the very last one we did, they just got better and better. This is beautiful! I would love to try sometime…will add to project book! Wow that turned out great! I love the stain pen aka glorified sharpie idea. It adds a depth of dimension by still being able to see the grain of the wood. I love it!!! you need some softness with the wood, and this is perfect. Much better than what the bridges I think! LOVE LOVE!i want to do this! thanks for sharing such a great project! Thanks! I don’t want to make something impossible seem easier than it was, but it really wasn’t that difficult to create the panels or copy the silhouette with a marker… you could also try transferring a photocopy with a blender pen like this, or ModPodge something. Here’s another wood panel I like with just simple text. amazing. have i mentioned i have a birfday coming up in november?! Love love love the wood panels! And this picture looks great! Think I stencil with paint would work too?? 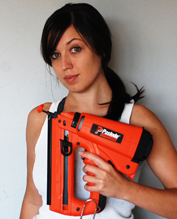 You’ve just added a project to my possibly diy list. And the funny thing, I painted that picture in a Brushes & Beverage I did…and then I just recently painted over it. But I would of never done that if mine looked anywhere as good as yours! Brushes & Beverage? Sounds like my kind of party! 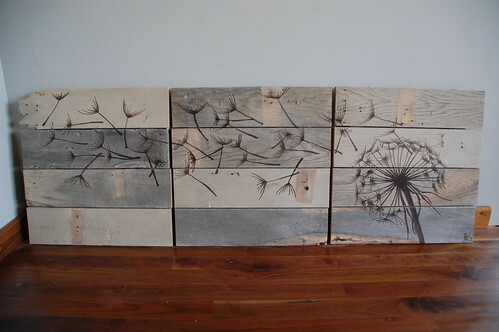 Also a stencil and paint would work great with this… there are so many possibilities. I love the way these look. Rustic, graphic, beautiful. Very nice. I like it ! I love this! If you ever want to sell it, please let me know! I LOVE IT!!! 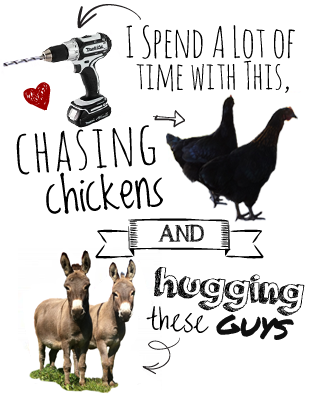 Since you don’t have a place to hang it quite yet…it could hang in my kids bathroom in the meantime! I would love love love to make one of these too! Would it maybe be possible to share with all of us envious readers your images in file form so we could print them off? Stephanie – I just used downloaded comps from iStock… here are a couple. Hope this helps! Love this project! So glad I found your site! Turned out great! And I’m glad to know about the marker you used–never heard of it before. This seriously looks like something out of the Pottery Barn catalog! I’ll take three, please. If you still haven’t found a place for your panels … take a look at my logo (www.ivonnesenn.de) and you know where their destined to hang on the wall … IN MY OFFICE!!! My sister just forwarded me the link for this week’s project. On initial quick glance I thought it was the front of a chest of drawers … there is another idea. I love the visual, it feels spacious and liberating. This is so stink’n cute!!! Found it on Pinterest. I totally want to make one for myself now! Did you stain the wood those different shades of Gray, or were they just already that awesome looking? What is the brand name for that wood marker? Can you just find it at Home Depot or something? Thanks for sharing! LOVE IT! 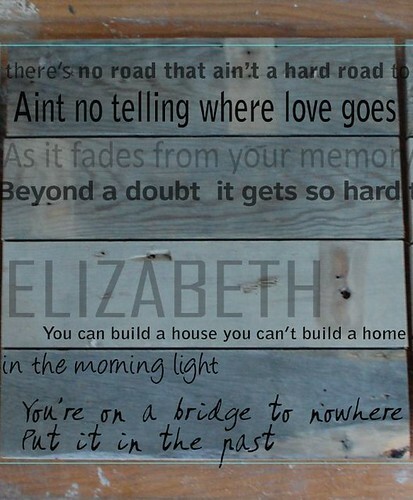 I cannot believe that you have Good Night Elisabeth on your lyrics….I was named after that song (middle) you and I got to choose it when I was 7 (long story)bcuz of my love for that song- I even walked down the aisle to the non lyric version of it..LOVE that you did that! Hi, this is so beautiful. I love dandelions. What creativity u have. I see others have alluded to wanting this, but in all seriousness, would you sell & for what price? I would cherish is forever…. Absouletely LOVE the dandelion! Any chance you’d be willing to make another and let me buy it from you?! Would love if you came and linked up at our party. We’re just getting it up and running and are trying to get the word out! This is gorgeous! I absolutely love it! Found you from OPC’s The Better Half! Hey, Just wanted to make sure you knew that you are featured link party winner over at the Humble Brag! Which means you WON one free week of ad space on our blog! Hope you are seeing a good increase in traffic and thank you again for linking up! This is awesome Jocie – thanks so much for letting me know! It was a really fun project. I have never done anything like this and you give me hope for my less than talented hands and brain! Inspiration for arting it up! Plus you’re pretty amusing, so I giggled a lot while admiring the work of an arisan! You are so talented – you are my home page! I always look here first for idea’s. 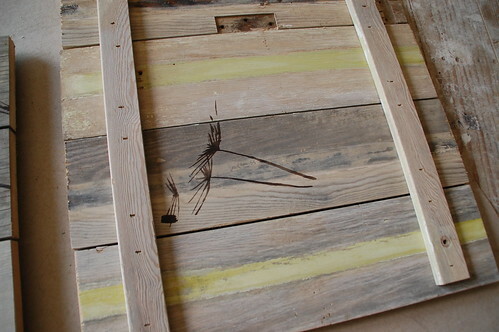 I did the dandylion on canvas – similar so when I saw it on wood, I thought, great idea! Love it – wouldn’t change it. Better than the bridge. Wow, I really love what you did here! I may copy it for my own home if you don’t mind. LOVE the picture! Love the blog – stumbled upon it while looking for deck/dock/boardwalk instructions for a new lake property. This is sooooo cool! Love the dandelion drawings. Beautiful. I love how rustic this looks. That is a super idea on how to put the text on the different panels, so each one is its own entity too. Sweet! Super job drawing the dandelion! A fun idea.